My husband saw this amusingly named "beer" at one of our local markets for about 110 yen/$1.16 per can (about 660 yen/$6.98 for this six-pack). Beer is divided into two categories in Japan. One is "real" beer and the other is "happoshu", which is cheaper because it has a lower malt content and can escape the tax category of real beer. A similarly sized can of actual beer costs about twice as much as this beer. I don't know why this beer is called "Strong Off" because that would seem to indicate that it has less alcohol or is less potent, but the "off" part refers to a reduction in carbohydrates (60%). The alcohol content is actually slightly higher than usual beer at 7%. 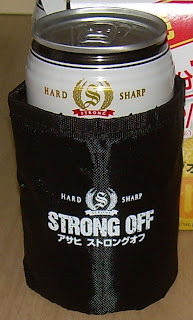 As part of the promotion for this new happoshu, this 6-pack came with a little insulating sleeve for you to keep your hand's warmth from warming the beer can as you drink. I don't drink alcohol of any kind, but my husband has one can of beer with meals several times a week. 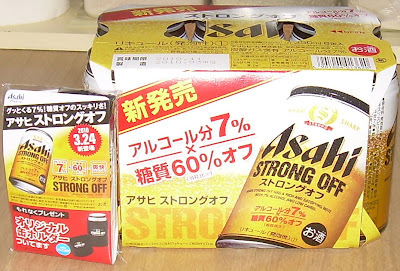 Usually, he buys a version of happoshu called "Style Free" or drinks imported beer that he gets at Costoco. He said that he felt this was actually better than the usual happoshu. Note that beer connoisseurs wouldn't be caught dead drinking happoshu. They rather despise it. Japinglish at its best.. haha I could go for a cold one right about now!! Hi, I tried this "beer" myself the other day, it's actually a "Dai San" or "Third Category Drink", not a happoshu. Japan has 3 categories of beers, Beer, Happoshu, and Daisan (the Daisan have even less malt, so even less tax, so are even cheaper - and taste generally awful). The best Daisan I've tried is the new, Sapporo Creamy White, it's fairly drinkable. Thanks to both of your for taking the time to comment!